Double Lobe Cervical Pillows provide uniform firmness and are anatomically shaped to maintain the head and neck in a neutral position. 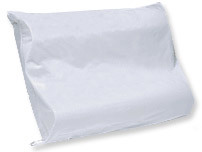 Made of polyurethane foam and includes a comfortable, poly/cotton protective cover with zipper closure. Comes in a pack of 3 pillows.